Mondays with Ilah are like having two worship days every week—one being when we attend our local church and the other being on Mondays at Ilah’s home from 2 to 4 p.m. If you were to drive by during this time, you would find her driveway and curbside filled with cars from the ladies who love to gather and work on their mission of helping others. One lady works full-time but works her hours around coming to Ilah’s. Everyone else is retired. One lady has a loved one living in a senior-care facility, and another is a caregiver for her husband at home, but no matter what their status in life, they all find time to give to this mission. 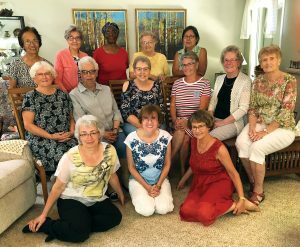 Most of the time these ladies are so good at what they do that they can spend two hours together knitting and crocheting without slipping a stitch or missing a crochet loop. But even when it happens, our host, Ilah, can look at our work and immediately identify the problem, remove our mistakes, allowing us to continue with our project. It is amazing to watch these ladies work. They can talk for two hours and discuss only the good things of life and never dwell on gossip or their problems. We begin every meeting with hugs that go around to everyone. We discuss the prayer requests from the previous week to see where God has led. Phyllis Delorme gives us our spiritual reading for the day, and then she leads us in prayer, presenting all the new requests. Ilah then presents, from her well-documented binder, where all of our work has been distributed the past week. Every completed project is documented in picture, and as it is distributed, she lists where and who it has been given to. Several people who have heard about our work wanted to be a part of this mission but, for various reasons, cannot attend our meetings. Some reside in other provinces, some cannot get time off work, and some cannot leave their residents. So they have offered supplies of wool, labels, and financial assistance to help with our work. We have had the privilege of Pastor DeSilva giving us a visit and presenting our worship talk for the day. It was one of our highlights, and he told us he was so surprised at the amount of projects that have been completed by such a small group of ladies. Ilah and some of the ladies go away for part of the winter, and those who are left behind do not want to stop working, so during those months, they will meet elsewhere. 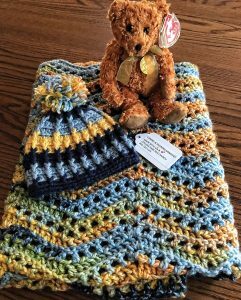 One of the most touching experiences is when we present a hat, blanket, and Beanie Baby to a new baby in our local Seventh-day Adventist church’s Cradle Roll Sabbath school division, on the family’s first visit. The Beanie Baby collection has been donated by the late Darlene Dalke. It is amazing that every time we go to the collection to select a Beanie Baby, there is always one to match the hat and blanket. We have given this gift not only to Cradle Roll babies but also to several babies in the area. We have also mailed these to several new-baby homes in Ontario and Nova Scotia, Newfoundland and California, as requested by someone who has connected with our group. 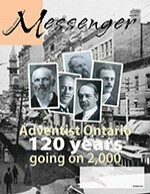 If you live in the Oshawa area and this mission is interests you, there is always room for one more chair.